I am trying to produce a high quality vector based map (in greyshades) in order to report locations. 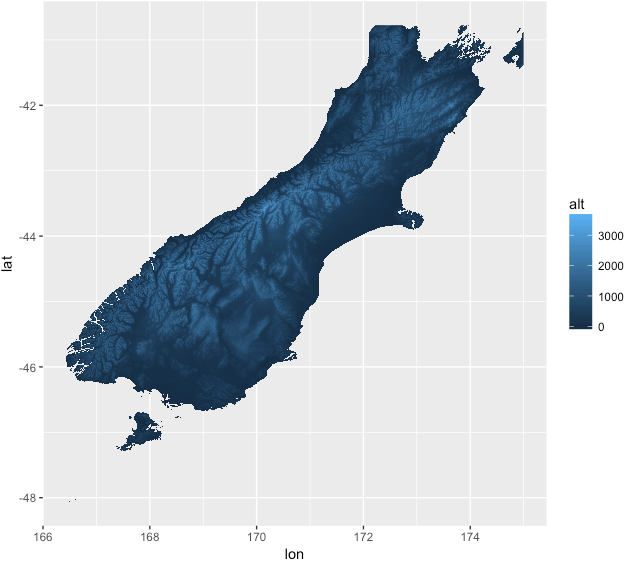 I tried this by getting maps from GADM and SRTM to make a raster as a base for plotting in ggplot2. However, the resulting data frame is too large for plotting. Quesion 1: How to simplify the data frame for ggplot2 without while still obtaining a high quality resolution map? This looks already very promising but it is way too heavy. How could I possibly reduce the data frame or use any other approach to obtain a nice high scalable vector image for my ggplot2 maps? I just started working with maps in R and basically I just want to produce nice terrain/topographic maps, and I don't want to use ggmaps or similar for this. Have you tried lowering the resolution of your raster data before creating the plot? Unfortunately, R is still slow for plotting large images so there is a trade-off between resolution and plotting speed. Not the answer you're looking for? Browse other questions tagged r topography terrain ggplot2 or ask your own question. How can i plot this piece of code with ggplot2? Use “facet_wrap” in ggplot2 with QGIS?